Maxine is suspected of having a deal with Joan. Meanwhile Susie is worried about her future, and Joan neglects to inform Doreen of her imminent release. Meg and Erica discuss Donna breaking into the drugs cabinet, and Erica remarks that she's been speaking on the phone to Vera, who has her own drugs problem at Barnhurst. Det Insp Grace takes Susie to the halfway house, and admits to Judy he tried to frighten her by threatening to charge her, as a way of keeping her on the straight and narrow. Maxine assures Joan she won't tell anyone what she knows when Joan warns her not to be so insolent to her in public. When she's late back into the laundry, Doreen accuses Maxine of having "an early morning workout with the Freak". Bea works out that Maxine must have something over Joan, but Joan is following behind Maxine and catches Bea heavying her. Bea is sent to clean the toilets, and Maxine is put on the press in her place, which only confirms the women's suspicions. Lizzie defends Maxine, saying she's certain that Maxine isn't having an affair with Joan. Mouse is brought back to Wentworth , charged with prostitution, petty theft, possession and illegal use of drugs. Maxine gives Lizzie a full bottle of whisky, but won't admit she got it from Joan. Mouse offers to deal drugs to Donna, and Donna goes to Lizzie to get the money, claiming that she knows how to get more booze for her: when Lizzie refuses to pay up front, Donna waits until she is insensible with drink (about 20 seconds!) and steals the money from her. Erica gives Joan a list of prisoners to be informed of their release, including Doreen: Joan objects that it was the policy in Queensland to leave it to the very last moment before telling women of their release. Bea finds Donna with some pills sold to her by Mouse and insists that Donna must go cold turkey. Donna goes to Hannah to ask her to lend her money, but Bea is following and intervenes, telling Hannah that you never give money to a junkie. Joan isolates Maxine by pretending she's asked to be put on garden duty: Maxine tells Chrissie she doesn't care as her boyfriend is going to pay her fine. Doreen tries to work out when she's due for release: she asks Joan, who refuses to tell her. Donna promises Inspector Grace to name names in return for "medication". Maxine is taken inside to prepare for release and Donna is taken out by Insp Grace. Before release, Maxine tells Hannah what she knows about Joan. 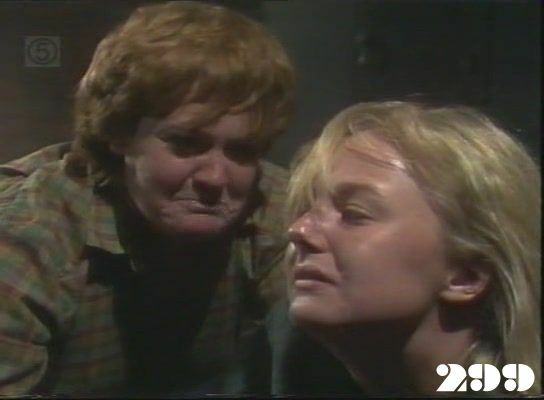 Hannah lets Joan know what she has been told, and Joan tells the story of her love for a prisoner in Queensland . Donna tells Bea she's out on probation and will live in the halfway house and Bea warns her to stay away from Susie. Hannah asks to see Erica to lay a formal complaint against Joan. When Colleen points out that it didn't come to anything last time, Hannah says that this time she has lots of witnesses.